If you simply look at this round and judge it’s potential, it’s hard to say that it won’t perform. Something as simple as how the fit and finish meld together and the high polish of the components shines in harmony; the way the polymer tip offsets the uniform look, makes this an obvious winner. If looks could kill: deer, elk and moose everywhere would drop where they graze. This is a beautiful round that denotes it’s capability in the bold profile it commands at a mere glance. But Federal doesn’t have to rely on the looks of the load to do anything and let’s the performance speak for itself. 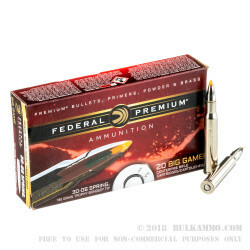 You are getting an ultra-premium, high grain weight projectile round that is meant for some of the biggest game on the continent. 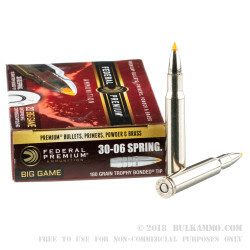 The proven 180 grain projectile is just the starting point. 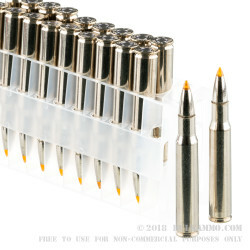 As a bullet, the Trophy Bonded Tip has few equals in the field. It is accurate, well balanced; offers great weight retention and sheds wind sufficiently. The track record for this load is something of legend. It has a great history of outperforming on important hunts everywhere. 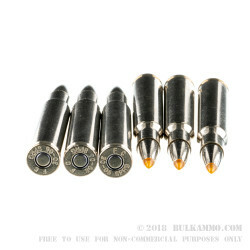 Suitable for use in any .30-06 Springfield rifle.